Many years ago it was a luxury to own a mobile but today it has become a necessity and it is normal for kids to use electronics such as smartphones and tablets weeks after they are born. 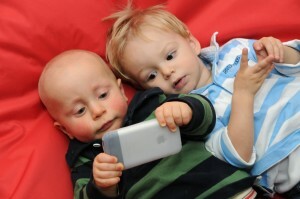 Babies use the smartphones mainly to play games; some of these games are made such that they develop specific parts of the babies’ brain but cannot replace physical activity. Using electronics causes the babies to sit in a sedentary state for many hours a day which can effect their health and how their brains develop. Older kids use the electronics for both games and staying in touch with friends via social media, which has become a huge part of young people’s lives. Smartphones are used everywhere and at any time, and people today are now getting treated for a condition called “Smartphone-neck” because they use their smartphone everywhere, even while walking which causes them to look down and put unnecessary pressure on their necks, also at dinner you will see young people using their phone instead of engaging in conversation. Now that smartphones have become easily available it is natural that the average age that kids starts using them will become lower and lower. There should always be a limit to the amount of time a baby should sit in front of a screen because there is a risk of them getting sleep deprived, anti-social, short attention span, no exercise and in some cases exposed to inappropriate content. A study in Australia that involved 56 kids has proved that children who are more physically active will develop parts of their brain much more than babies who are mainly using electronics for entertainment. The physical activities help to develop eye-hand coordination, visual perception and fine motor skills; these attributes cannot be learned through a screen.Another study from American Pediatrics have even shown a direct link between too much screen-time to a delay in learning how to speak and a lot of babies use smartphones before they can walk or talk. An average 12-month old is exposed to 2 hours of screen time per day. This is an increasing number, which means that that amount of physical activity will decrease. Unfortunately tablet and smartphones are used as a baby sitter, parents now go to dinner and have the baby entertained by an iPad. Conclusively, we are not encouraging you to completely stop exposing babies to electronics, but instead to make physical activities the main method of entertainment. Focus on your baby’s health and development, make sure to have safe toys that will help them to develop their brain, talk to your baby so they can learn to imitate you and the language. A baby´s brain will grow a lot during the first year, in particularly the first 3 months, and what ever it is exposed to will have an effect on how the brain will develop. It is therefore very important that we dont make the baby´s life a sedentary one but instead make it active. A sedentary lifestyle can cause babies to have discomfort and even experience pain in the back or neck. At Emirates European Medical Centre we treat babies with great succes; babies, children and kids respond very well to Chiropractic care. Does your baby have physical problems? Call us today to book an appointment with Dr. Pam who is an expert in treating babies.